These Vivienne Westwood babies are gorgeous and I want them. Now. 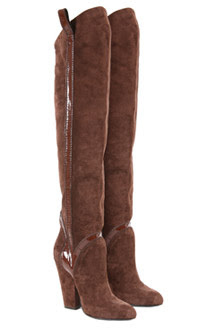 Suede, tick, over the knee, tick, my size, tick (well sort of they only have a six left but that’s fine) They have been drastically reduced from £420 to £149.99 which I think is great value for money. Now any tips on persuading the bank manager?? I really have to have them.